You might not have thought that there was any sign of life in the Bulls today with the Dow down 92pts, but the Bulls pushed the stock indices into the green after being down over 200pts in the morning. As we approach OPEX I think the volatility will get even crazier. I remember last year at this time there was a huge gap up on the indices on OPEX Friday(it was August OPEX 2007, FREAKING NUTS). Check out the Max Pain that happened August 17 2007. After OPEX I'm expecting volatility to decline and the market to start to crawl back up. (I've been thinking we would have bounced for at least a week now). 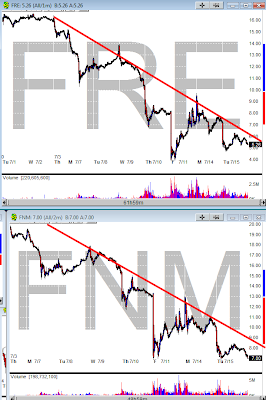 FRE and FNM closed near there lows again.